DancePro Series dance floors offer the spectacular look of real wood, parquet floors combined with the durability and practicality of a polypropylene base. 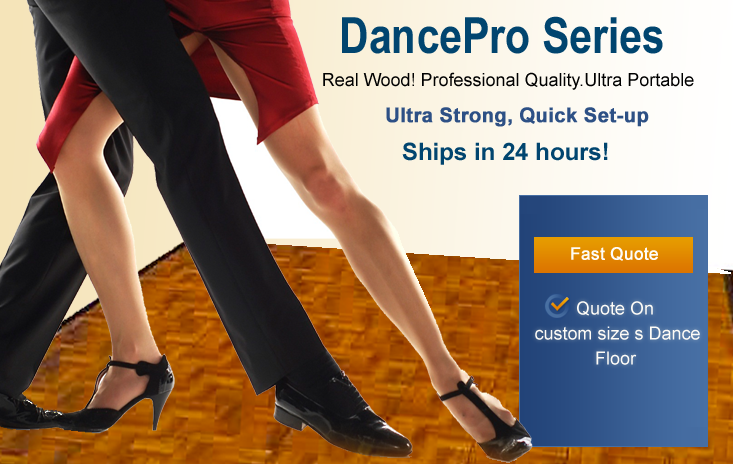 DancePro Series is the perfect choice for those looking for a real wood dance ultra portable, modular dance floor that does not require a large-panel system. DancePro flooring can be used indoors or outdoors and is the best choice for weddings and other events that demand the elegance of real wood, but require a practical, durable and simple-to-install system. DancePro modular floor tiles are available in two different wood finishes ( Chestnut and Desert) and come in 1ft x 1ft x 1/2in, modular floor tiles that weigh less than 2 lbs each! Our simple male-female connection system allows for quick assembly without tools, cams or mechanical devices. In fact, a full 12ft x 12ft dance floor can be assembled by 2 people in 30 minutes! And our patented 7-loop connectors (the most loops of any tile on the market) provide the simplest and most secure connection of any other portable dance floor tile on the market. For added ease, DancePro floors ship in pre-assembled 3ft x 3ft panel sections. Optional Storage/Transportation carts are also available. If you are looking for a custom size dance floor, please call our friendly staging experts at: 877-884-3426 or email us at orders@thestagedepot.com for assistance.